How would you like Restored MPG? To regain lost engine PERFORMANCE? TERRACLEAN is a proven way to remove more harmful carbon deposits, tars and varnishes than other products. It offers a preventative maintenance service of the fuel system, exhaust and sensors. The benefits can be felt as soon as the car is driven after the treatment! 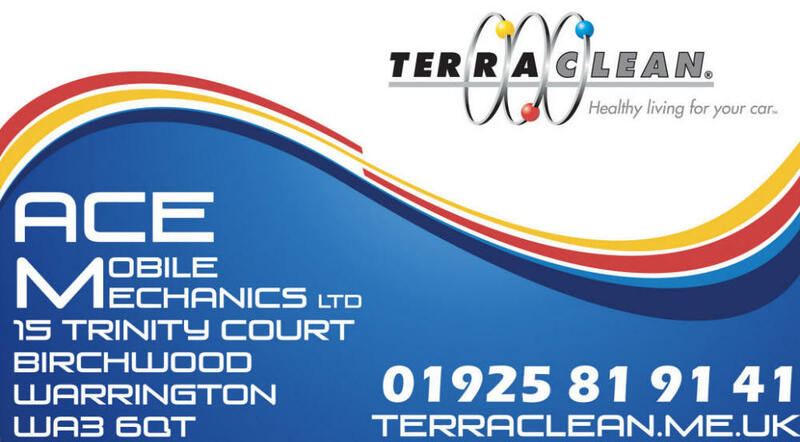 We offer a workshop based TerraClean service (Birchwood Warrington) or can come to you with our new mobile TerraCleaning service. TERRACLEAN thoroughly cleans the fuel system and engine internals as follows. Fuel injectors cleaned, restored spray pattern. Combustion chamber, removes carbon deposits from valves and piston surface. Catalytic convertor, extends life by cleaning carbon deposits. O2 sensors, cleans and extends the life of the sensor. Diesel pump, cleans and lubricates the inner moving parts. Got a blocked Diesel Particulate Filter??? Call us today to book the treatment on your vehicle either at our workshop or at your home or workplace. ©2014 ACE Mobile Mechanics ltd - Trading as TerraClean Warrington.